I’ve been wanting to communicate more emotion in my work. Well, this one made me cry. My mother’s brother, Richard, had a reputation as good-looking and fun-loving. My older cousins, who knew him when they were little kids, looked up to him. I’ve always felt cheated to have lost my uncle before I even knew him. 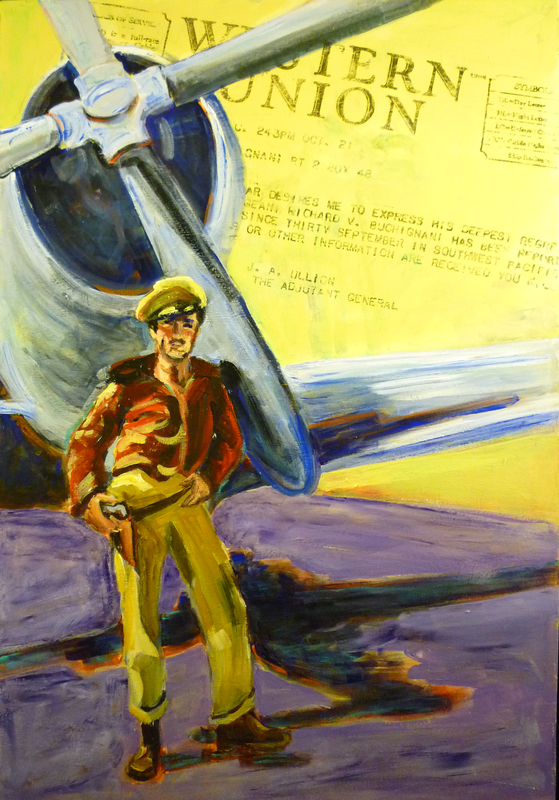 In this painting, based on a photo taken of Richard in the Pacific Theater, he exudes the personality I imagine for him. In the background, I used an applique technique to include an enlargement of the telegram announcing he was missing in action. The idea of including this documentation came from several sources including my mentor Marcy and a show of William T. Wiley works I saw in Berkeley.